Following the passing of the Scottish Poor Law Act in 1845, administration of poor relief in Scotland was carried out by a Parochial Board set up in each parish, or in a group or "combination" of parishes. In the southern part of Mainland, Shetland's main island, a joint Board was set up by the parishes of Dunrossness, Sandwick and Cunningsburgh. At its inaugural meeting on 17th December 1845, the Board elected Mr John Bruce, a local Justice of the Peace, as its chairman. John Harper, a grieve [farm overseer] from Sumburgh, was appointed Inspector of the Poor in Dunrossness at a salary of £3 per annum. John Johnston, a fish curer of Sandwick, was appointed Inspector of the Poor in Sandwick and Cunningsburgh at a salary of £4. 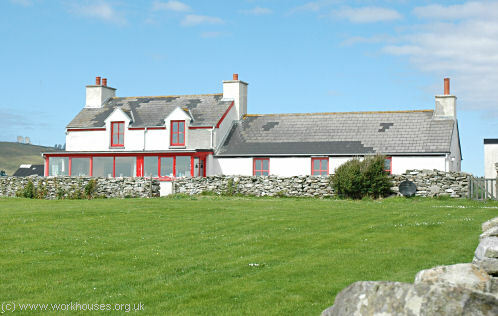 The Board met at a number of locations including the Church at Sandwick, the Church at Dunrossness, Leebotten, and at Sand Lodge — John Bruce's large house at Sandwick. John Bruce continued as the Board's chairman for many years, and Sand Lodge increasingly became the regular venue for Board Meetings, perhaps in deference to the John Bruce's increasing age. Meetings were often cancelled in bad weather when insufficient Board members were able to attend. When meetings did take place, the proceedings began with a prayer. Margery Duncan at Bressay, strong looking person. Refused. Andrew Morrison's son must take his father home and take care of him. Jane Mouat and sister - allow 20/- to pay for their Peats and write to their well to do relatives in America to do something to keep them off the Roll. The minutes of 11th September 1868 record the suggestion of sending a pauper named Jane Gaudie "to lodge at Vatchley at the house prepared by the Board to lodge a few sick and aged paupers". According the 1882 map, the poorhouse was at the south-east of Vatlsee [Vatchley]. Dunrossness Poorhouse site at Vatchley, 1882. 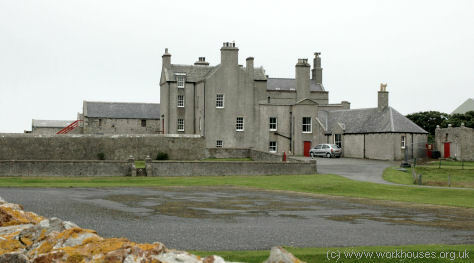 The former Dunrossness poorhouse is now a private house. 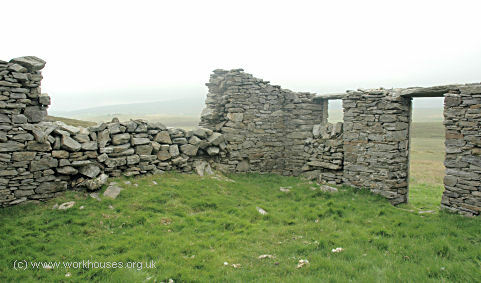 Dunrossness poorhouse from the south-east, 2006. The Board minutes also make mention of another poorhouse at Stove (near Hoswick). The location of this establishment is not known. 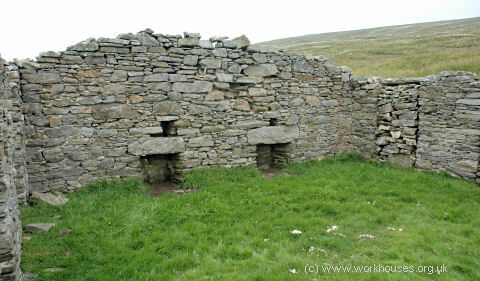 A small poorhouse operated in the 1870s on the island of Unst at Vallafield or Valleyfield, to the west of Baltasound. Its location makes it the most northerly and most remote poorhouse or workhouse in the British Isles. Unst Poorhouse site at Vallafield, 1882. 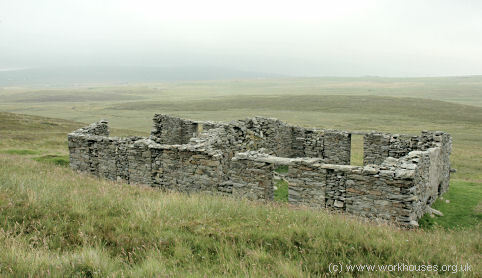 Unst poorhouse from the north-east, 2006. The single-storey building contained just two rooms. 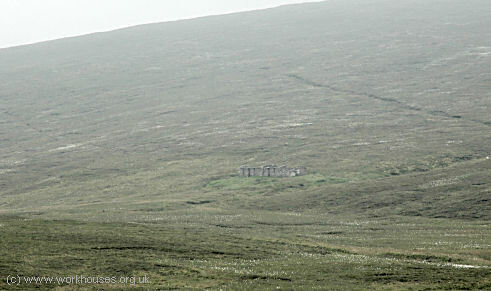 Unst poorhouse from the west, 2006. Unst poorhouse interior view, 2006. Shetland Combination comprised the 12 parishes of Bressay, Delting, Dunrossness, Fetlar & North Yell, Lerwick, Nesting, North Mavine, Sandsting, Tingwall, Unst, Walls & Sandness, and Yell. The total population of the member parishes in 1891 was 29,705. The Shetland Combination poorhouse was located on the Scalloway Road to the west of Lerwick. The official laying of its foundation stone took place on 23rd June, 1886 and the poorhouse opened on 17th September 1887. The site's location and layout are shown on the 1900 map below. The building, which could accommodate 72 inmates, was mostly single-storeyed apart from a two-storey section at the centre. Male inmates occupied one side of the building and females the other. Shetland Combination poorhouse from the north, 2006. Shetland Combination poorhouse from the west, 2006. Shetland Combination poorhouse from the east, 2006. A small mortuary stood at the south-west of the main building. 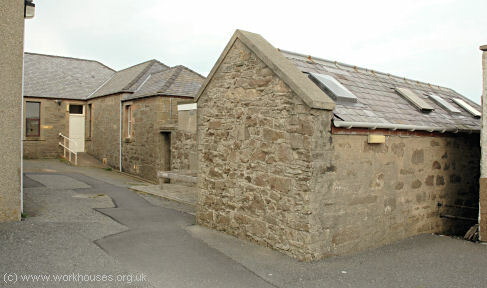 Shetland poorhouse mortuary (right), 2006. The Combination also operated a hospital just to the north of the poorhouse. The building has now been replaced by the Gilbert Bain Hospital. After 1930, the poorhouse became Zetland County Homes. In 1946, the establishment had 58 beds for the chronic sick, aged and infirm, and up to four mental cases. 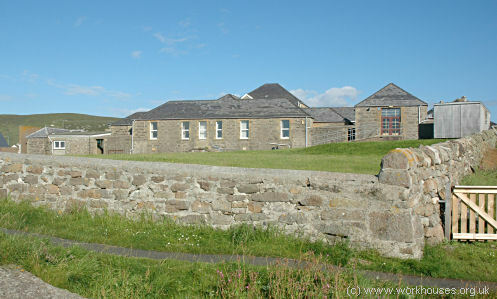 The building is now used as offices by the Shetland NHS Board. Shetland Museum and Archives, Hay's Dock, Lerwick, Shetland ZE1 OWP. Holdings include: Poorhouse and County Homes minutes, financial records, and case lists (1884-1962); Combination Hospital minutes and ledger (1885-1930).